I'm married to a Panhandle farmer/rancher. His family raises beef. Therefore, we eat beef. I'm married to a Panhandle farmer/rancher. His family raises beef. Therefore, we do not eat chicken. In all seriousness though, Royce refuses to eat chicken 99 percent of the time. It is a struggle. Anyway, supper. I'm chowing down on a roast beef sandwich from the steer we raised last year: Wee Baby Shamus. Let me tell you, he turned into one delicious beef carcass! What does my roast beef sandwich have to do with Texas Panhandle agriculture? For one, the roast beef on my sandwich was raised right here on our farm in the Panhandle. Two, he was just one in around 2.5 million head of cattle fed out in a 150-mile radius of Amarillo last year alone. True, 150-mile radius of Amarillo actually pushes you out of the Panhandle (and Texas for that matter), but I think you get the gist. 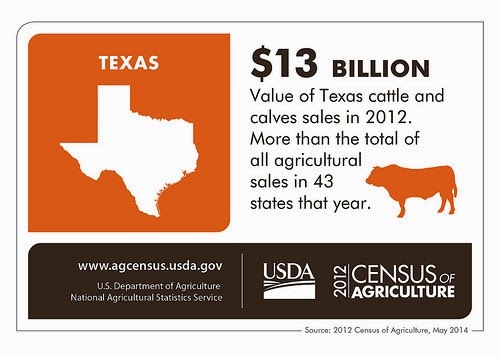 Like I mentioned yesterday, Texas is number one in the United States for beef production, and I think it is pretty obvious the Panhandle plays a big role in that number one status. Shoot, we have the "Beef Capital of the World" right here in the Panhandle, most aptly named Hereford, TX. Not only do we have lots of calves every year, we also feed them out in feedlots located right here in the Panhandle. The Panhandle is also home to several beef processing plants, where cattle are slaughtered once they have reached their optimum weight or are "finished" at the feedlot. I know a lot of misperceptions about the beef industry are out there today. I'm in no way a beef expert, but I happen to be married to a guy who knows a whole bunch about beef. With his help, I'll be tackling some of those myths later this month. Keep an eye out for that, but until then, if you are a consumer concerned about where your beef is coming from, you can rest assured knowing we eat beef raised the same way as you buy beef in the grocery store, and we take a lot of pride in raising that Texas Panhandle beef. 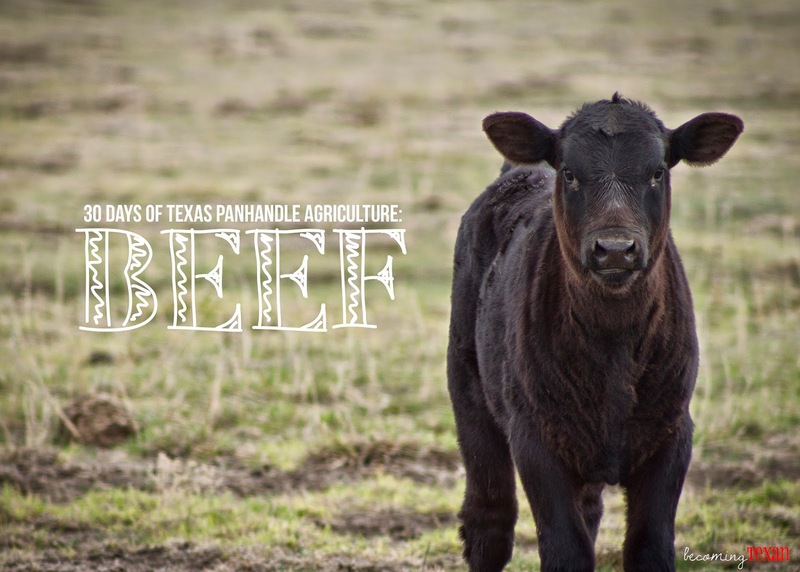 If you are interested in learning more about Texas beef, check out Texas Farm Bureau's A Look at Texas Ag: Beef Section. This is the second day of my 30 Days of Texas Panhandle Agriculture Series. To read more, please visit this introduction post. If you have questions or ideas about Texas Panhandle agriculture, I'd love to hear them!